A special computer assisted program that serves as an adjunct of both VA medical and education benefits, to increase veteran awareness, mental alertness, socialization and interaction in the real world. 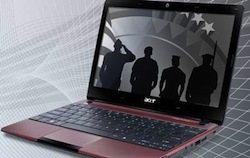 The computer application program is designed to build the veterans' basic computer knowledge and enable the veterans to augment their interests and global access. Upon successful completion of the program, veterans will have acquired basic computer skills to independently operate a computer. By successfully meeting the above objectives and goals for the Computer Application Program, veterans will have gained knowledge of basic computer proficiencies that they can use as a tool to communicate using the latest technologies. This will build their confidence and enable them to interact with others effectively. To be eligible for this program, You must contact your VA Vocational Rehabilitation Counselor at one of the numbers listed below. The VA must determine that you are a Veteran with a service connected disability rated at 20% or higher. The achievement of a vocational goal leading to employment is not currently expected or required to participate. The Fee is $52.00 per contact hour. The program is 52 hours in length. This tuition is paid by the VA Chapter 31 Benefits for those Veterans who are qualified to attend.